I recently realized that Tarte Amazonian Clay Full Coverage Concealer and Tarte Maracuja Creaseless Concealer are two different products. How in the world do I let things like this slip me by? They look so similiar I hadn’t realize it was too different concealers. Duh! Tarte Amazonian Clay Full Coverage Concealer was recently released for Spring 2013 in five selections on QVC. One of the best parts about this launch is the fact that QVC bundles the concealer with an excellent Double-Ended Airbrush Concealer Brush much like my beloved Sephora Pro Airbrush Concealer Brush for $23.14. Where can you get a full coverage concealer and a brush for application at that price? Tarte Amazonian Clay Full Coverage Concealer is a super buildable concealer created with Amazon Clay that keeps skin balanced. It works on oily skin the mattify and dry to hydrate. Pretty crazy idea that a single ingredient can perform two very separate functions. This concealer formula promises a waterproof 12 hour wear with a weightless texture. They aren’t joking about two things, the long wear and the full coverage. A single drop will conceal most major issues such as dark circles, finer lines, and puffiness. Or if you’re using it on your face acne scarring, dark spots, and redness shouldn’t be an issue to conceal with a formula as richly pigmented as this. I didn’t personally like the Maracuja Creaseless Concealeras it was a smidge to emollient and thick for me however, it seems that Tarte improved upon that formula with Amazonian Clay Full Coverage Concealer. This is a lighter texture with a hydrating formula but isn’t as emollient as the Maracuja formula. It has a thick almost grease paint texture, I know, sounds rather discouraging but you need to know how to work with it for the best results. I think aging eyes will be intimidated by such a formula as it does seem like a product you’ll need to tug on to get blended out correctly. The key here is plenty of prep work. Make sure your eyes are hydrated well if you have drier eyes (oily eyes need not worry). Squeeze a small amount, VERY small, onto the back of your hand. Now swipe your brush back and fourth into the concealer several times building color onto the brush but also dispersing with a majority of the concealer. Not slowly brush onto eyes and pat into place with fingers. Use the larger side of the brush to swipe across the area you blended with your finger. This basically gives an airbrushed finish to your blending job. Done! Perfect coverage and an airbrushed appearance. They aren’t kidding when they say this is waterproof with twelve hours of wear. Applied correctly it’ll remain crease-free and will wear through a full eight to ten hour day without fading away or creasing. Now I think Tarte Amazonian Clay Full Coverage Concealer is a challenging product to use which is why it’s great that Tarte provides you with the correct tools to get the most from this concealer. It has a learning curve but once you start applying it correctly I think you’ll be quite happy with the results. The brush is a god sent as I really do think this is what aids the concealer in looking its best and most flawless. Overall, Tarte Amazonian Clay Full Coverage Concealer provides FULL coverage so if you have dark circles you’re struggling with you’ll find that this conceals MAJOR issues such as those. Thank you for the great and detailed review! I wish so much that Tarte was available here in Germany. I ordered this back when the TSV was airing and this was on pre-order. I should be getting it sometime this week. 🙂 Can’t wait to try it! Thank you for the review! Mine is on it’s way, and your description definitely helped. I was curious how it would be different from the Maracuja concealer. I like the Maracuja when rushed since it’s easier to get out (than my other fav IT’s Bye Bye Under Eye), but when I do that it doesn’t cover as well as BBUE. BBUE does best for me with the brush, as I have bad hereditary circles under my eyes (plus have allergies and sleep problems). The description and brush remind me of It’s concealer. The light looks really light to me, I hope I’ll be able to use it! Can’t wait to get this, thank you! I really love the maracuja oil concealer, but now I really want to try this :). Thanks for the review and swatches! u think they might throw this into a kit muse? maybe for summer? i noticed tarte does that with their new products. This looks promising, I like the formula of the foundation (though the shades aren’t perfect for me) do you think this concealer could be used on blemishes too? How does this compare to my fav, Erase Paste? What is your current HG concealer? I have been having a hard time with concealers creasing. Maybe it is my technique. 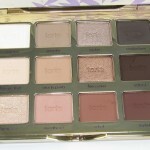 This tarte one looks great but I might need something more foolproof. I am actually wearing the Tarte Maracuja Concealer :D. I like it though–I apply it with fingertips and it melts into my skin and stays put. I agree with you that it’s too thick for the undereye area so I only use it on the rest of my face for discoloration. But seriously?! 12 hour wear?! I might have to give this a try. I wish there was a list of ingredients though on the QVC website (just checked and didn’t see it). And how much are you getting in that tube anyway? Agreed that this bundle looks like a great deal. hey maggie this isn’t going ANYWHERE…seriously when it sets it sets ;-D jeepers I tossed the box sorry otherwise would have posted a list of ingreds. I believe it is 1 oz in size but will confirm when I get home to look! ahhhhh I was so excited when I heard tarte was releasing this concealer! 😀 hope sephora will carry it soon. My HG right now is IT BBUE, I use the medium in the winter (or light and tan mixed) and Tan in the summer. I’ll try to come back with my application technique after I find another keyboad to replace this one – i keeps skipping letters.WTF??? This sounds good, I’d really really like to try it! But I’ve also heard amazing things about the new NARS concealer. I can’t recall if you’ve done a review or not on that. D; A girl can’t have too many concealers can she? that’s my case EVERY time ;-D always find a new one to try! Ok you like the IT Concealer…How do you compare this one to that? vastly different products ame this is thick, emollient versus IT which has a hydrating but less grease paint texture. yay happy to hear mayette! I’d love to hear your thoughts when you tried ’em :-D! wait until you see Summer 2013, it’s a great selection of goodies! Hey muse! I wanted to know if this duo will be available on sephora anytime soon? 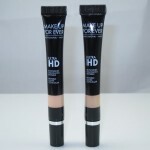 It seems like a great deal since its a brand name concealer with a great under eye brush! I hope you have some kind of inside info that could help me! jackie perhaps june as that’s when the powder is launching at retailers. don’t have an exact date though! Try tweeting Tarte, bet they can give you solid info! I have been using this Tarte Amazonian Clay Full Coverage Concealer for a week now. I’m 60 years old, so the “aging eye” is definitely in place. This is the first concealer that I’ve tried that covers my dark circles in one application. I had to play around a bit with this product before getting it right. Works best with eyes that have been treated with an eye cream and/or Tarte’s 360 eye primer. I like it best with just eye cream. “Less is definitely more”. You just need a teeny bit on the smaller end of the brush. I then work it in with the larger end of the brush. I try not to tug or use my finger because of the fragile skin around my eyes. This is a keeper for me! Hi Muse, would you say the medium shade of this new concealer is the same as the ( medium ) of the maracuja creaseless concealer ? Thanks! Hi Muse – My everyday foundation is the foundation from this line in the brown tube. I wear medium. Would you say the consistency of this concealer is the same as the foundation? I have dry skin and the foundation works like a dream on me. Also, would you recommend the light shade for the concealer or the medium – I wouldn’t mind a slightly highlighted effect under the eyes, so I’m wondering if I can blend out the light with my foundation as well, or if it is too light of a shade? I just purchased this off qvc in the shade medium. I was and still am confused at which shade I am because I am fair skinned but not extremely white. I have more of a blue color under my eyes (veins) so I wasn’t sure if going with the light would hide it. However I like the highlighted look under the eyes, but of course I want coverage. I am shade medium-sand in the the amazonian clay foundation, so I figured maybe medium would fit. Idk im nervous to see what the result will be when I get the product. I ordered this twice from QVC and loved it. I ran out of it and went back on their site and its no longer available!! I can’t find this anywhere else. I’m so bummed!